Haxnicks offers several products to fit all of your air-pruning needs. And they are easy to use, clean, store, and reuse! For seeds, plugs, and cuttings, try our innovative Rootrainers. 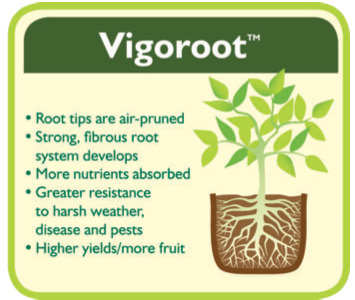 And for hydroponic gardening, patios, balconies, and more, go with our Vigoroot Pots and Planters to provide a super-strong root system for all your plants, fruits, and vegetables. Air Pruning happens naturally when roots are exposed to air. The roots are effectively “burned” off, causing the plant to constantly produce new and healthy branching roots. If roots are not exposed to air, they continue to grow around the container in a constricted pattern. Short root systems with several root tips are significantly more productive than long or fat root systems. Roots that are white in color with many root tips are the most important for healthy plants. Why Use Air-Pruning Pots & Planters? With most containers, roots grow to the outside edge of the pot and then circle, over and over again. Basically, the roots grow in overlapping circles that follow the inner walls of the container. Since plants absorb the majority of their water and nutrients from the root tip, this overlapping could actually harm the root system and create an inferior environment to form a healthy plant. As the roots take over the interior space of the container, little room is left for soil to hold water and provide nutrients, which may lead to root death...stunting the plant's growth or leading to it's demise. Some refer to this as "pot-bound" or "root-bound." Pots and planters made specifically for air-pruning will help you to avoid overlapping and, thus, constricting the root system. Air Pruning systems form stronger root systems for far better plants, fruits, and vegetables. We offer several products to fit all of your air-pruning needs. And they are easy to use, clean, store, and reuse!